Our shavings include Green Large Flake, Herms KD Ecco Flake, Herms KD Mini Flake, Herms KD Medium Flake, and Herms KD Large Flake. Our suppliers work hand in hand with the Forestry service to insure the proper utilization and preservation of our forest. All of our shavings are triple screened then bagged, palletized and shrink wrapped to insure that our standards are met and the quality is maintained. We are available 24/7 to service your shavings needs and look forward to working with you. Herms Lumber Sales and Shavings was founded in 1978 in southern California and is a family owned and operated business. The company was formed with the intention of forming strong relationships with our suppliers. By doing this we were able to buy soft wood lumber products direct for the sawmills producing it and then sell it at a competitive price to industrial accounts across the US. Because of our focus on customer service and just in time inventories, the business has grown over the years to include multiple locations across the US. 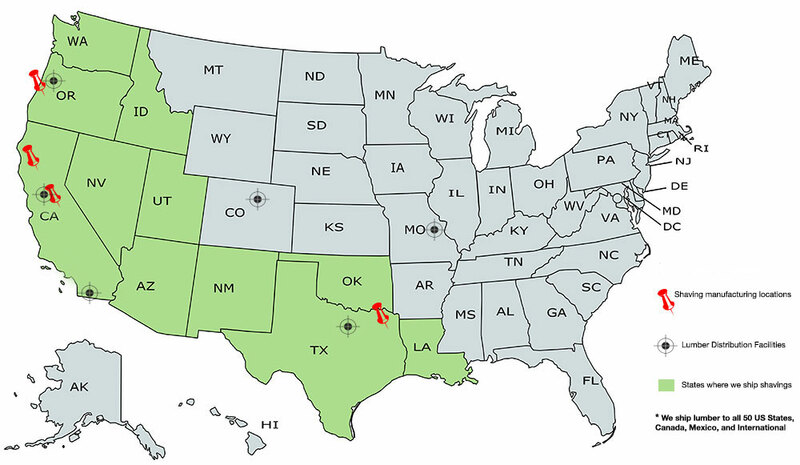 We currently have seven distribution facilities in 5 different states spanning across the US allowing us to sell our products nationwide as well as other countries. In 2004 we were approached by some of our sawmills with the opportunity to sell the shavings they were producing while manufacturing the lumber. Our first facility was built in Southern Oregon and started bagging shavings under the Gutches Label for the equine industry. With immediate success we built a large following and increased our production and products to two more facilities in Northern California and started producing bag shavings under the Herms Shavings Label. With three manufacturing facilities and 5 different shavings products we have grown into a leading supplier of animal bedding. Our wood shaving products are all made in the USA from a renewable resource.